With all the flurry of attention surrounding the drought these days, it’s hard not to feel overwhelmed by the bleak future of California’s water. Apocalyptic forecasts and desolate images dominate much of the recent media dialogue. While it is clear the drought is bad news and its effects will trickle into a variety of sectors from our food to energy supplies, much of the conversations surrounding the drought often only reaffirm the collective sentiment that we are all doomed. As a result, the once slow-moving disaster has quickly transformed into a state of emergency, creating an atmosphere of alarmism that, in the end, only helps to advance quick-fix, band-aid solutions. 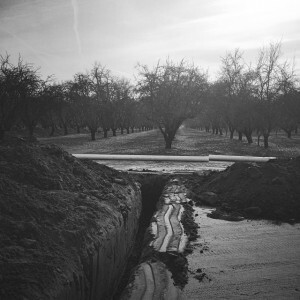 For farmers across California, drought has been a major, longstanding concern. Agriculture is a major user of water in California, accounting for about 80% of the state’s developed water supply. The good news is that there are opportunities to reduce the agricultural sector’s use of water, and therefore its vulnerability to water supply constraints, while maintaining or even improving crop yields. Expanding on already existing and newly emerging innovative technologies and strategies is one way to do this. Some farmers and irrigation districts are already leading the way, implementing innovative, on-farm water conservation and efficiency practices, including scientific irrigation scheduling and efficient irrigation technologies. To recognize leaders and innovators in the California agricultural community, the Pacific Institute launched the Farm Water Steward Award in 2012. Every other year, a Farm Water Steward Award recipient is chosen from success stories submitted on the Interactive Database of Ag Water Stewardship Case Studies, launched by the Pacific Institute and California Roundtable on Water and Food Supply, which features innovative and effective efforts of farmers who work to improve on-farm and regional water management. Highlighting farmers already moving in innovative directions is especially important for leading by example and empowering collective change to overcome barriers and create a resilient agricultural sector for the future. In January, Madera County almond grower Tom Rogers was awarded the 2014 Farm Water Steward Award for his leadership and innovation in water stewardship across the California agricultural community. The award was presented jointly by the Pacific Institute, Community Alliance with Family Farmers (CAFF), and Ag Innovations Network at Glide Ranch in Davis, California, just days after Governor Jerry Brown declared a drought emergency in California. Efforts like Tom Rogers’s in water stewardship are a gentle reminder that even amidst all the desolation of the drought, there is light (and even water) at the end of this (seemingly waterless) tunnel. His story, and stories about other innovative farmers like him, is exactly the sort of uplifting narratives we need to amplify and rally around. “Together, we can all be water stewards,” he says. Sustaining California’s water resources in an increasingly uncertain future involves working collaboratively—with farmers, industries, communities, water utilities, laborers, and the public—to implement technological innovations, rethink priorities, adopt smart economic policies, integrate water into statewide planning, and modify water management institutions. Part of embracing the “new reality” and building a more resilient water future involves reimagining our relationship with water such that we view our collective water use in a new light. Learn more about Tom Rogers, 2014 Farm Water Steward, from his audio interview here. For more information on the Farm Water Steward Award, click here. For more information about the 2014 Farm Water Steward Award presentation, including a list of speakers, click here. The Farm Water Steward Award was established to recognize leaders and innovators in water stewardship across the California agricultural community. Growers, water districts, and agricultural organizations are invited to submit case studies to be considered for the next Farm Water Steward Award on the Interactive Database of Ag Water Stewardship Case Studies at: www.agwaterstewards.org/index.php/case-studies.